DYI Keratin hair extensions might seem like a good idea. My business offers very thorough hair extensions consultations for installation and for removal. If you hair is medium to thick then a full application can consist of up to 400 individual bonds. The amount of hair installed will, also vary according to your natural density, too. Most applications can take 4 to 8+ hours to install. It can be expected to lose some extensions, it has been my experience than my clientele does not lose an excessive amount. A professional removal is just as important as a certified professional installation. Hair extensions removal appointments will vary in the length of time for a various of reasons. One of the best features about keratin hair extensions is the fact that you are able to brush then right at the scalp. 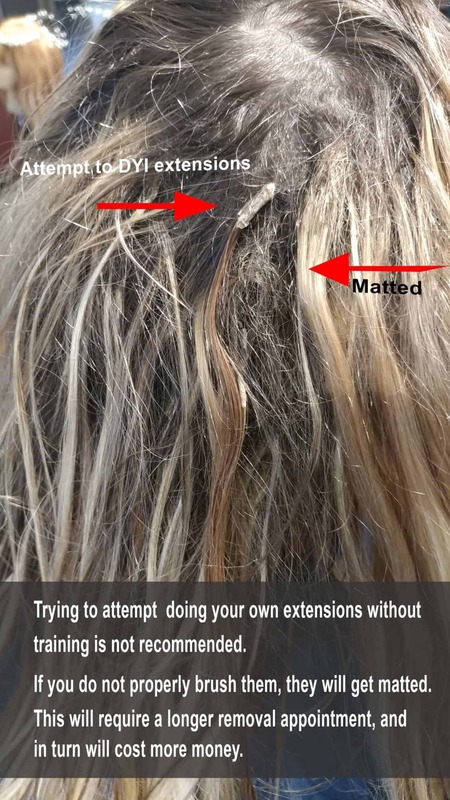 If you properly take care of your extensions, then there will be not matting. More importantly is the brushing because the attachment will encase your natural hair. Your natural hair will still need to shed, but will not have anywhere to go. The extension next to it will be going through the same process. It is really important that you brush, brush, brush your hair extensions! If you are new to the salon, then you it will be necessary to book a new client consultation. Next, another date will be schedule for your removal. If you do not like or enjoy having lengthy salon appointments and/or look for a way to save money when it is time to have your extensions removed, then be sure to brush your hair extensions daily. Matted extensions are caused by improper care; which can result in damaging your own natural hair. Matted extensions will prolong your salon visit, and certainly is avoidable. All salons have different price points, brands and applications to offer. I love being able to offer so many solutions. In my experience of being certified for 11 years and featured by Modern Salon Magazine, the right hair extension application is the one that best suits your lifestyle or budget. Unfortunately, my salon is often sought out for hair extension corrections.